Very few people have perfect teeth. Straight teeth and a good bite with perfectly aligned teeth are the hallmarks of a beautiful smile. If you would like to have an attractive smile but you have crooked teeth, you need to have them straightened and aligned with the help of a dentist. However, many people, especially adults, don’t feel comfortable with the idea of having traditional wired braces. If this represents how you feel, you might consider getting Invisalign clear braces. 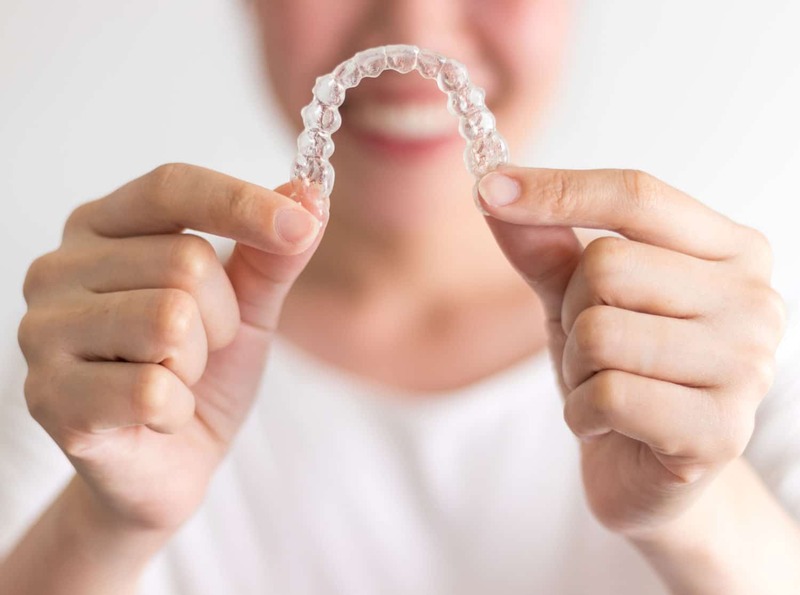 Invisalign clear braces are the most recent and safe way to straighten teeth and correct minor bite issues. If you have problems with crooked teeth, you no longer have to wear unsightly metal braces that can make you feel embarrassed about your smile. Invisalign appliances are made of either plastic or acrylic material. They are highly transparent, which means that they are barely visible to others, unlike traditional metal braces. Invisalign appliances are comfortable to wear because they are custom-made to fit in your mouth. Treatment with Invisalign typically takes between 10 months and two years, with almost 24 hours wear every day. First of all, you can only get Invisalign clear braces from your dentist’s office. That’s because each Invisalign clear braces appliance is custom made to fit your teeth. This is why Invisalign clear braces are so comfortable to wear. When you go to visit your dentist for Invisalign clear braces, you’ll receive a comprehensive dental examination. A computer is used to create an Invisalign appliance that completely matches the contours of your mouth. A 3D model is made with the computer’s help. Finally, a usable Invisalign appliance is made that you will wear. This appliance is specially designed to gently move your teeth into the position they need to be in to have straight teeth. You’ll need to wear the Invisalign clear braces for at least 20 hours every day, for the next two weeks. Then, you’ll make follow up visits to the dentist to get a new impression for a new Invisalign appliance. This process continues until your teeth are correctly aligned. During the entire treatment span, you may have between 18 and 30 different Invisalign appliances, depending on your particular circumstances. 1. Invisalign clear braces are practically invisible to others because of their transparency. 2. Invisalign clear braces are removable. If you have a special occasion, you can easily remove the appliance temporarily. 3. Invisalign clear braces are very comfortable to wear because they are customized to fit the contours of your mouth and teeth. There are no sharp edges or sharp points, unlike metal braces. 4. The process is very easy to understand, with no surprises along the course of treatment. 5. You only need to wear Invisalign clear braces for between a year and a year and a half. Only teens and adults should use Invisalign. Invisalign clear braces are not suitable for children because their jaws are still growing and braces could interfere with that growth. Invisalign clear braces are best suited for those with mild to moderate crooked teeth. Severely crooked teeth will need an alternative form of treatment. Invisalign is an effective and non-invasive way to achieve a beautiful smile. If you’re interested in seeing what Invisalign clear braces could do for you, please contact our office today to schedule an appointment.